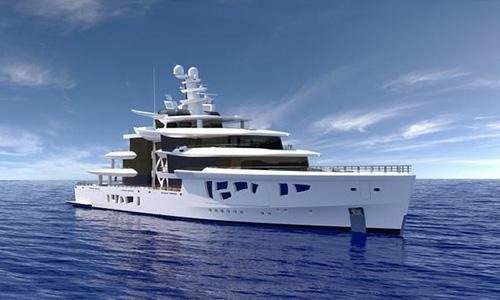 Rendering of Nobiskrug's 80-metre superyacht Artefact. 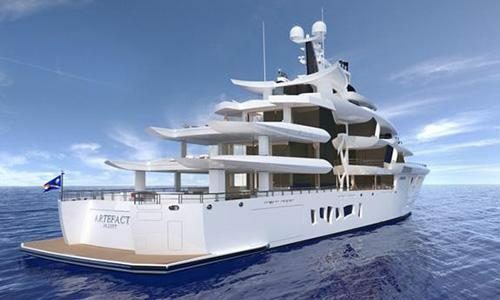 Designed by Canadian-based naval architect Gregory C. Marshall, Artefact is due for completion in 2019. It is the latest project from the Privinvest-owned yard, which delivered 142.8-metre (469-foot) Sailing Yacht A to Russian owner Andrey Melnichenko last year. The yacht will be built from steel, aluminium and teak while the exterior will feature a large amount of custom and curved glass. UK-based design studio Reymond Langton Design will be responsible for the interior. A unique central section of glasswork – which includes 223 pieces of glass and weighs around 70 tonnes – is a key feature of the new design. Pascale Reymond of Reymond Langton Design, stated, “The shape and size of windows really became a springboard for us for some incredible design." Nobiskrug has revealed that the yacht will include a number of new technological and engineering features as a way of minimising its environmental impact. Solar panels and a large battery storage system will allow the yacht to operate without internal combustion engines for a limited time. Artefact is also fitted with a positioning system, which can hold the yacht's position without dropping an anchor to protect the sea floor. It also features a system which enables the reuse of waste water as technical water. "This project is a true example of the owner’s focus and his vision to build a distinctive state of the art hybrid superyacht with as many integrated environmentally friendly features as possible,” added managing director Holger Kahl. The yacht is among the first superyachts to meet IMO Tier III emissions regulation and features an advanced diesel-electric propulsion system developed with electric motor manufacturer ABB. The finished yacht will attend the 2019 Monaco Yacht Show.